Stop using gut instinct and start testing decisions about your digital products, commerce, and campaigns. 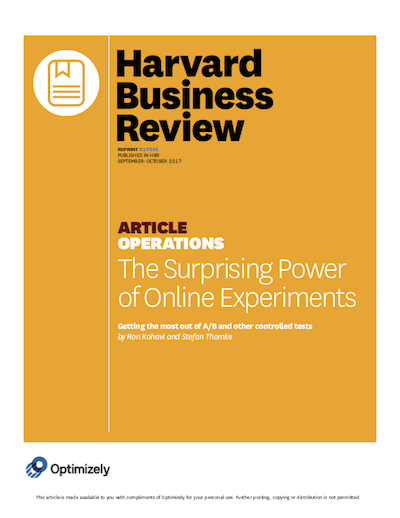 experimentation is essential for competitive advantage. With a centralized team helping to drive learnings and best practices, the BBC has built a true culture of experimentation. See how the BBC is using Optimizely to power customer experiences across their digital channels. Optimizely X is the world’s best “test and learn” software platform for product development and marketing teams. Continuously test new features and user experiences to determine which options will provide the best business outcomes, all backed by data and statistical models. Increase revenue, share of wallet, funnel conversion, risk mitigation, and operational efficiency of digital programs by up to 500%. We put four little words on the shop page in big letters - You can cancel anytime. And that drove a 10% topline order uplift. So pretty powerful result from a test that probably cost less than 1000 dollars to stand up. Optimizely is really letting us experiment with our product. And ultimately we are seeing step changes in our key metrics. That’s really important, that’s very powerful. Optimizely is the partner of choice for thousands of organizations in every industry, including 26 of the Fortune 100. Evaluate any product, commerce, or campaign initiative and model what a 10%, 20%, or even 500% performance improvement could mean to your business. How well are you testing today? Take the Experimentation Maturity Assessment and get feedback on your current position within the maturity curve and learn how Optimizely can help you move further along on the curve.